Are you ready to start the adventure journey in Neverland following our hero – Peter Pan? Pan movie, an original story for Peter Pan and Captain Hook, has launched on 9 October 2015. Actually, trailers on YouTube have involved a huge number of fans (both young boys and parents) in charm of this great movie for kids. Hope to watch Pan movie at home or on portable devices whenever wherever? There are two ways for you: free download Pan movie or rip Pan movie DVD. 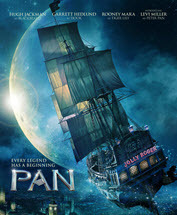 First of all, take a look at brief introduction of movie Pan. Please explore patiently on YouTube or similar site and you may dig out several pieces of HD Pan movie trailers even full movie videos. If only you could find the source, you can free download Pan movie video using WinX YouTube downloader with no effort at all. WinX YouTube Downloader is an easy-to-use online movie downloader for Windows 10 and lower versions available to download movie videos (full movies/trailers/soundtracks) in MP4, WebM, FLV or 3GP with high fidelity from YouTube, Dailymotion, Vimeo, Metacafe and alike sites (300+ in total). You can choose to get SD, 720P/1080P HD, 4K, 8K or 3D movie according to the original video source. Next, let's go to free download Pan movie (HD) using this WinX movie downloader. Launch WinX YouTube Downloader and tap + link-shaped button. Search Pan movie video on YouTube or other supported sites. Copy and paste link of you desired video to address bar of pop-up window. Tap Analyze button to access to video info: title, duration, list of version varying from resolution, format, size and code. Select one version like 1920x1080 MP4 and click OK. Tap Browse button to set destination folder (hard drive or devices) and click Download button to start free downloading Pan movie video. To be honest, it is easy to find Pan movie trailers online but much difficult to obtain full movie videos. Even though you are so lucky to have one, it may be a fake or deleted for copyright infringement. If you want to watch Pan full movie on devices with no troubles at all, we suggest you to rip Pan movie DVD. WinX DVD Ripper Platinum is the No.1 fast DVD ripper helping you to rip/copy Pan movie DVD to MP4, AVI, WMV, MOV, MPEG, FLV, 3GP, iPhone, iPad, Android, Windows Phone, PS3/4, Xbox etc, with removal of copy protections and deliver crisp output movie video. It also enables you to extract audios in MP3, AAC, WMA, AC3, FLAC etc, with lossless quality from DVD. With advanced settings, you can customize the output video by trimming/cropping/adding subtitles or adjust parameters (bit rate, resolution, aspect ratio and more) to get desired effect. WinX DVD Ripper Platinum - Rip Pan movie DVD or any other home-made/protected commercial DVD movies to MP4, AVI, WMV, MOV, MP3, iPhone, iPad, Android, Windows Phone etc, with vivid images/hi-fi audios. Insert DVD disc into DVD-ROM. Launch this WinX DVD movie ripper and tap DVD Disc button to import Pan movie DVD. You can also take ISO image and VIDEO_TS folder as movie source for ripping. A couple of seconds later, all DVD titles will be loaded and the main title is automatically checked. Meanwhile, the Output Profile dialogue appears. Select one format you want to rip Pan movie DVD to. 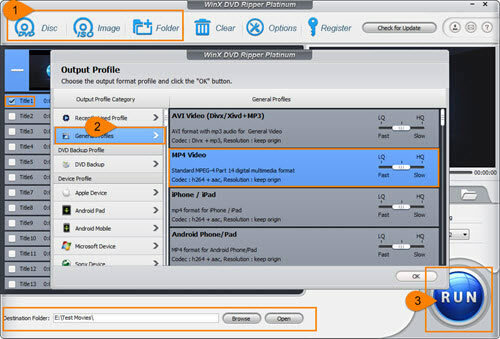 Tap Browse button to save the output movie video to a specific folder (hard drive or device) and click RUN button to start ripping Pan movie DVD. • Copy a DVD to ISO image file, VIDEO_TS folder, MPEG2 video with intact movie content, lossless video quality, 5.1 Channel AC3/DTS Dolby audio.